Campaigners are calling for women in England to be allowed to have medical abortions at home. Currently, women have to take two separate trips to a clinic to receive abortion pills in order to take them in front of medical staff.The charity British Pregnancy Advisory Service (BPAS) says it can cause women a huge amount of anxiety and is entirely avoidable.After taking the pill, symptoms of miscarriage can start quite quickly.Women are often on public transport or in public places when they begin bleeding and suffering cramps. 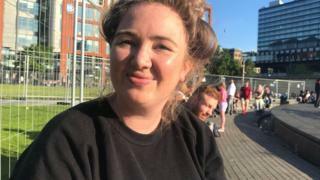 After the Republic of Ireland's vote to legalise abortion, campaigners want to address the way terminations are handled in England.Pressure is also building in Northern Ireland, where abortion is only permitted if a woman's life is at risk or there is a permanent or serious risk to her mental or physical health. "The first day was fine," she told Newsbeat.The second day though, was much worse.After taking misoprostol, her symptoms started straight away which she says included "really heavy bleeding, pain, very intense cramps, vomiting and really bad nausea". "It all happened whilst being in a stranger's car - it was very, very unpleasant and the journey was 45 minutes long. "As soon as the car pulled up to our halls, I basically got out the car and crawled to my room." Official government figures show that each year around 180,000 abortions are carried out in England, with medical abortions the most common way of ending an unwanted pregnancy. Medical abortion involves taking two types of tablet.The first, mifepristone, stops the hormone that allows the pregnancy to continue working.The second, misoprostol, is normally taken 24 to 48 hours later and encourages the womb to contract to pass the pregnancy. After four to six hours, the lining of the womb breaks down, causing bleeding and loss of the pregnancy.In England, the tablets have to be taken at a hospital or clinic, but in Scotland women can take misoprotol at home. Wales are planning to introduce the measures too. "I just can't think of any good justification, other than punishing women for being in the unfortunate position of needing to seek abortion," Alex tells Newsbeat. "There's no good reason not to follow Wales and Scotland's lead in it. "Alex travelled home in a taxi on her own after having a medical abortion.She says about 15 to 20 minutes into the journey she began to feel "an intense gripping pain" in her abdomen. "I also started to feel very, very sick and very faint - the blood had drained from my face and I had a cold sweat. "I managed to communicate to the driver that I wasn't feeling very well and he pulled over. "I opened the car door and projectile vomited onto the sidewalk. "Alex says she felt much better when she got home and was in "a relaxed environment". "If that had been that environment for the whole procedure, I think it would have probably been a less traumatic experience for me." Being able to take misoprostol at home is "safe, effective and preferred by women", argues Clare Murphy from BPAS. "The Secretary of State for Health, Jeremy Hunt, has the power to extend this dignity to women in England. "The only reason to deny women the option of home use is political, not clinical, as this is a safe, evidence-based measure that would improve women's experience immeasurably at a difficult time. "Wherever we stand on abortion we should be able to agree that women deserve the highest standards of compassionate clinical care when the decision has been made to end a pregnancy. "The Department of Health has told Newsbeat it's their priority to ensure that care is safe and of a high quality and that it will continue to monitor the evidence surrounding abortions at home.For more help and information about abortion, search the Radio 1 Advice pages. Follow Newsbeat on Instagram, Facebook and Twitter. Listen to Newsbeat live at 12:45 and 17:45 every weekday on BBC Radio 1 and 1Xtra - if you miss us you can listen back here.